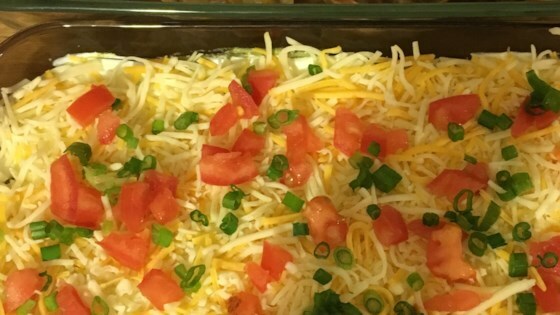 "This is one of my favorite recipes. Great for football games, tailgates, or any party. Very EASY to make!" Heat refried beans in a microwave-safe bowl in a microwave oven until hot, stirring frequently, about 3 minutes. Spread beans onto the bottom of a serving platter; refrigerate until the beans are cooled completely, about 10 minutes. Spread guacamole in a layer atop the beans. Spread sour cream atop the guacamole. Sprinkle cheese over the sour cream; top with tomatoes. Cover platter with plastic wrap and refrigerate until cold, about 30 minutes. I made this with one change. Instead of guacamole I used about half a pound or more taco meat. It was AMAZING. Loved this!! With such few ingredients it was surprising how good it was! My husband loved it too. Didn't take very long either to make. I definitely recommend this! Great version to use when you have vegetarians in the crowd. I added chopped tomatoes and green onion as an extra topping. Definitely a keeper ... Delicious! Yes, I used organic refried black beans, fresh guacamole, organic sour cream, Mexican cheese blend grated cheese and used diced green chiles instead of tomatoes. YUM!